Wow you are going fast....It's such a adorable little cat.. 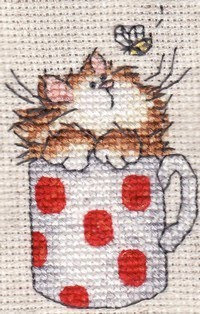 This is cute too and you stitched this very fast! Wow, you stitched that in a jiffy! Cute cat! Super ces petits chats !!!! Il ont l'air rapide à broder apparemment..... Il va être content DBF !!! AngelSan Creation 2018. Powered by Blogger.